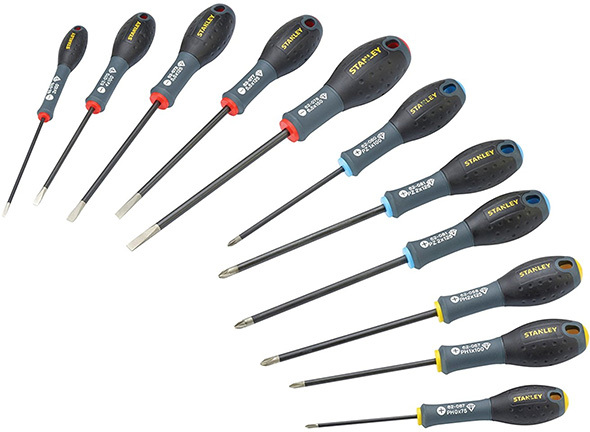 I always avoided buying screwdriver sets or tool sets that included Pozidriv screwdrivers or bits. If there were two options, one with and one without, I went with the Posidriv-excluded option. It’s because I very rarely came across Pozidriv screws. And when I did, Phillips drivers worked, albeit with some camming-out and fastener head damage. But that happens sometimes when Phillips screwdrivers or bits are used on Phillips fasteners. A few months ago, I started putting together more IKEA furniture. A dresser for my kids, here, small kids bookcase there, a night stand for my wife, under-desk drawer unit, and some wall cabinets. I remember reading something about IKEA screws mostly being Pozidriv. Yep, the screw heads all have those “I’m a Pozidriv fastener” markings. It’s something I probably knew previously, but I got along with Phillips just fine, well, reasonably fine. 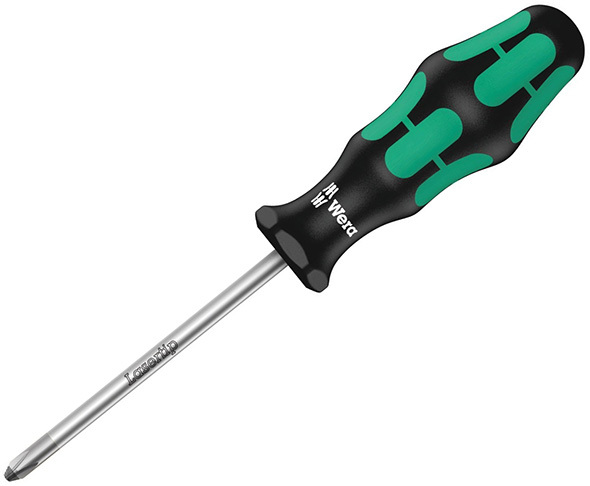 But since then, I’ve kept a Wera Pozidriv screwdriver in a kitchen cabinet, and it comes out whenever new IKEA furniture is being assembled. It was included in a Wera 2016 advent calendar I purchased last year. I have also put a few previously neglected Pozidriv bits to use. Let me tell you – they work beautifully well. I rarely damage a fastener head, and everything goes together a little quicker and a little smoother. 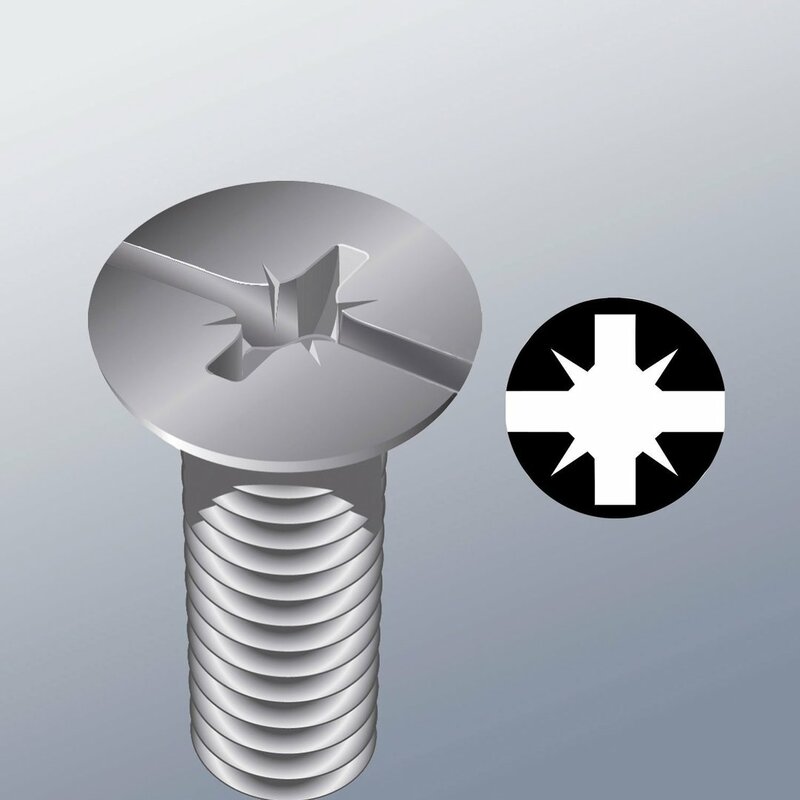 I prefer hex socket fasteners for machine screws, and Torx-head or Robertson (square) fasteners for wood screws. Phillips fasteners are still ubiquitous, and in some cases unavoidable. Small self-tapping screws, for instance, are more widely available with Phillips heads. But, by golly, I didn’t realize Pozidriv was so good. Lots of people complain about Phillips-head screws and screwdrivers, wishing for something better. In my experience these past few months, I’ve learned that Pozidriv is in fact way, waaaaay better. Long story short, I’ve been loving my Wera Kraftform Pozidriv #2 screwdriver, with its comfortable handle grip and laser-grooved LaserTip tip. 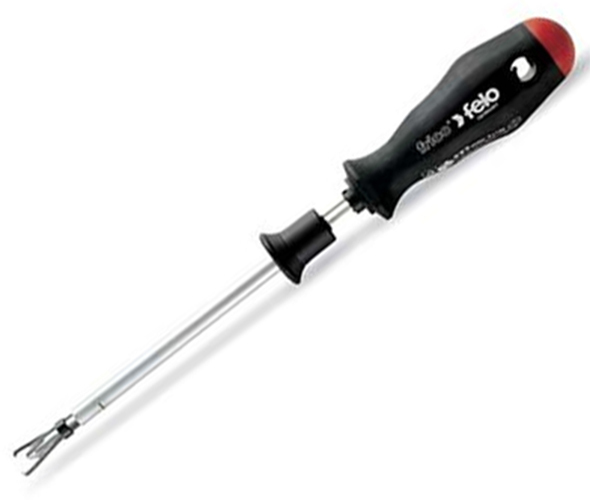 Lesser screwdrivers might still do a capable job. But when assembling IKEA anything, you’re not dealing with a few screws, you’re working with lots of them. And if you have a few items, you could be talking about dozens of screws. At least. You can use power tools, but only if you do a lot of trial and error with the adjustable clutch. I learned that the hard way a few years ago, when I unintentionally over-drive a few screws with a Black & Decker 3.6V screwdriver. So there’s my recommendation for a good IKEA furniture-assembling screwdriver. Other “essential IKEA tool recommendations” will come another time. If ordering through KC Tool, coupon code TOOLGUYD4LIFE will save you an extra 10%. Update: Here’s a Pozidriv screw head. 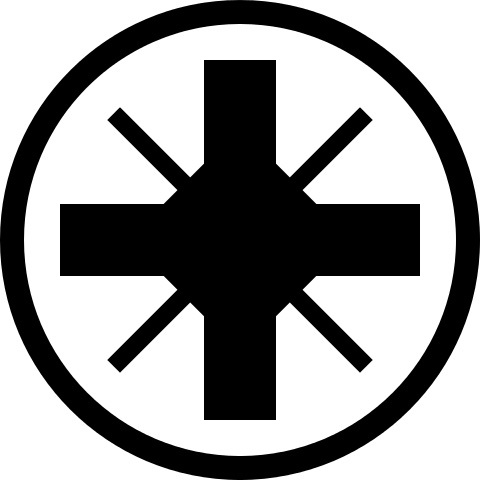 The radial lines are markings that help to differentiate a Pozidriv screw from a Phillips screw. The screws that adjust the hinges on my kitchen cabinet doors are Pozidrive. I found that I needed to adjust the hinges twice a year when the weather changed from hot and humid to cold and dry and then back, and I struggled with a Phillips head, destroying screw heads in the process. Then about five years ago I discovered the Wera and now one lives in the kitchen drawer for exclusive use on the cabinet doors. Time to pick up another one for the garage tool box. This is good advice when it comes to Ikea and other low cost furniture and cabinet hardware. Also, I recommend using high quality hex/allen wrenches or drivers, they made the assembly much smoother when compared to the included tools. I have had pretty good luck using my M12 driver when I set the clutch setting very low and use the lower speed. I got sick of Ikea furniture as well, and ended up purchasing a pozidriv Wera bit set (https://www.amazon.com/Wera-Pozidriv-Mini-Check-Sheet-Metal/dp/B003KN3G4Q). It was more economical than buying the individual driver, and I don’t really need another entire screwdriver set (at least that’s what my wife tells me). Ask her why she keeps more than one jar/tube/etc of moisturiser. This post makes me chuckle. In Europe perspective, Posidriv is the norm and Philips heads are now virtually impossible to find (was the reverse when I was a kid). Building Ikea furniture armed with a Philips screwdriver sounds like torture. If switching to a Wera driver is a revelation, try sticking a Posidriv #2 bit in a basic 12V drill-driver (something like the Dewalt DCD710) on a low-ish torque setting. I’m not saying you won’t pick up the Wera again but the cordless setup will be your go-to option. I’ve used the Dewalt inline Gyro screwdriver for some assemblies, especially when my son wanted to help out. But using a Pozidriv has made it so much easier that I don’t mind using a manual screwdriver. If I were putting an entire room together at once, I’d likely do just that – reach for a cordless screwdriver or compact drill with adjustable clutch. Same here in South Africa. I was a kid when Phillips last ruled. Even the electrical screws are designed for the Xeno-Pozi/Slot drivers as opposed to the Xeno-Phil/Slot found in the States. Sadly, most if not all electricians here don’t know the difference between Pozidriv and Phillips, let alone a Xeno driver! Slowly but surely we’re all starting to read from the same page. Joren, a xeno driver is a normally an electrician’s screwdriver that combines either a slotted + Phillips (US) or slotted + Pozidriv (Euro). If you ever pick up a machine bolt and notice the head has a particularly long slot with a short cross recess, that requires a xeno driver. Designed to allow either a slotted or Phillips screwdriver to be used but to get the most purchase, a proper xeno driver should be used. I have both varieties in screwdrivers made my Wera as well as a 50mm power bit. Milwaukee calls them “ECX bits”. And Klein calls the same “Combo-Tips”. Not exactly the same. Those are a combination of a Robertson [square] and Slotted. I can relate to this as well, I’ve had a lot of arguments with colleagues who can’t differentiate between pozidriv and Philips head screw drivers. Most of them would say, they’re one and the same. But like you said, we’ll get there eventually. Am an Electrical Technician based in Zambia’s Copperbelt. I grew up in Rhodesia/Zim and my father also worked up on the Copperbelt but in the 60s. Good to see other Africans on this blog. Dewalt gyroscrewdriver is a godsend when assembling ikea furnitures. My biggest IKEA tool purchases were the Husky 3/8 in Drive Metric Hex Bit set. With those, particularly the 4, 5, and 6mm I can use my “cheap yet does everything I’ve ever asked of it” Husky ratchet to install the Hex topped screws which seem to be in everything. Works much better than the little keys and I always know where this set is, unlike the keys which seem to run off immediately. And if the assembly really pushes my buttons (not that that’s ever happened of course), I could put the 3/8th adapter to my impact driver on and that furniture is never coming apart. I share the distaste for Philips though. I haven’t decided if I’m siding with Torx or with Square but while I use my #2 for seeminly everything, I want something else. Pozi screws don’t seem as available in my local orange store so it’s probably Torx or Square in the short term. Question: Is there one particular size of Pozidrive (PZ) that Ikea furniture uses? I have a bit set for PZ but the idea of a PZ screwdriver for the most used size is appealing. I’ve used a PZ #2 with good results. It fit the very small screws that go into a Raskog cart, small and larger screw-in knock-down peg thingies, small wood screws, drawer slide screws and machine screws, and probably other types I forget to mention. When too lazy to reach for a slotted screwdriver, I’ll use the same for the knock-down cams, unless they only have a slotted recess. I do have some PZ #1 bits, but I don’t think I’ve come across a fastener that needed them. thanks! So PZ2 it is. I have a bit set but will probably get a dedicated screwdriver in that size as well. Going to do a kitchen remodel using Ikea cabinets. I am not the stubborn type, complaining about yet another screw-head type. I ended up getting a Milwaukee driver set to get ECX which i really like as I am doing a bunch of electrical wiring recently. Like that too! It’s less than $5 directly from KC Toolco and you get to use your special Toolguyd discount. Granted you pay shipping but still. two – I like pozidrive when I find them and I keep some bits for them. It’s odd you don’t see them more for philips in home improvement centers but I guess most of the industry is moving over to torx and hex. which I prefer anyway. I find the IKEA stuff I have built has all been hex – metric hex. side note – of late all the wood screws I’ve bought recently have been torx also – with very limited exceptions. I haven’t been to an IKEA in maybe 3 months! I’m going to have to fix that soon! IKEA is a low-effort means to reasonably good solutions. I used to use my own hex keys on IKEA furniture, but I don’t come across them as often as I used to. The last two things I put together, a small under-desk drawer unit, and a small night stand, only had 4 hex-recess fasteners each – confirmat screws that were easily assembled using the included Z-shape hex key. On the second one, I used the hanging hole of a Milwaukee slotted screwdriver to cheat a little bit. I am wondering if your positive experience is a compounding factor of a superior design + using the right tool for the job + wera quality + the negative experience of using a phillip driver on pozidriv screws. Years ago I had to go though the adjustment of cabinet hinges and picked up the Snap On version of the Posi drive screwdriver, fits perfect and it really makes a difference. #2 square bits work just fine if you don’t have a posidriv bit. Used that just fine for some Ikea stuff a couple months ago. Ohhhh….. 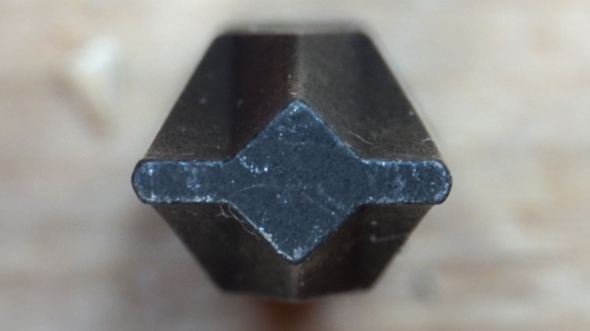 I never realized those screws that look like square/phillips combo are actually pozidriv. I just always use a square bit on them. No they’re not. Just another combo screw but very different from a Pozidriv which has those little ‘ticks’ at 45 degrees to the normal cross. There is another screwhead made by the same company called a Supadriv which features what looks like a Robertson/Square center combined with a Pozidriv. I am very similar in avoiding sets that came with posi drivers. I was even kindof annoyed my calander came with one. I guess they do have their uses, and atleast I know I have a quality driver if I ever need one. I would really like to see another shift in industry completely away from philips though. I hate those buggers, and I still lament that robertson did not liscense his heads out more freely. We could have avoided philips heads all together. IKEA furniture ,but expensive tools and tool storage? ….the wera tool probably cost more then the furniture you can buy at ikea……..
That sounds about right for me. My kids need dressers and a place to put their toys. I can build dressers and bookcases for my kids, but I don’t want to. I have too many other things I want to do, and too many other things I need to do. IKEA satisfies my immediate needs with sufficient quality. I HATE furniture shopping, in general. We went looking for a dinette table, and had to drive maybe 40 minutes to one of 2 places anywhere near us. The guy was pushy, and the products so-so. Of course the one that we were mildly interested in just happened to be exactly what our ballpark budget was. Oh, it’s too small for chairs side by side? That’s okay, we could buy the narrow “ladies” version of the matching chairs. That was over a year and a half ago, and we still didn’t buy a new table for the kitchen. In the spring, that’s probably a project I’ll tackle – a small dining room table that perfectly fits my needs and space. It’ll probably take a few trips to furniture shops to get a feel for pedestal designs and support leg dimensions. Anyways, IKEA furniture has some limitations, but it’s sufficient for the time being. Our dressers have lasted for 10 years and 2 moves. When my kids outgrow their small dressers, either they’ll get something better, or maybe then I’ll make something better. But for the time being, immediate needs are met with an immediate solution. I have a chef’s knife that I like, and an 8″ All-Clad saute pan that I bought on deep discount last year. That doesn’t mean I should cook a meal anytime someone comes over. Honestly, if you avoid the cheap stuff and add some glue to the assembly, Ikea makes quality stuff, especilly all the kitchen line. I used a bunch of sektion cabinets to buil a desk. They are great and not very expensive. I got a couple Felo Smart Handles (based on the recommendation from this site) during KC Tool’s Black Friday sale. I added a couple Wiha Power Blade to it (Pozidriv #2, Hex 4mm and Hex 5mm), and voila the perfect Ikea assembly toolkit. Plus if you get tired of turning screws you can use the “Power Blades” in any 1/4″ power driver. I love that I continue to learn something new from your posts. I’ve heard of pozidrive before, but always ignorantly assumed it was simply a brand name (face palm). I’ve had some success using standard dewalt bits in my Bosch drill/driver set to very low torque. I don’t anticipate any more ikea projects in the near future. Pozidriv is a newer(relatively speaking) and better alternative to standard Phillips drives for most if not all applications . The fact that cam-out is part of the Phillips design – may be useful in some limited applications. Not surprisingly Ikea , Blum and other European hardware uses pozidriv rather than Phillips drive screws. I’m not a fan of most things Ikea – or knock-down particle-board furniture in general. But If you have to assemble it – then buying a quality pozidriv screwdriver or using Pozidriv bits – with a powered screwdriver should make you life easier. When the kids were in college, I did buy and assemble some of this sort of dorm room or temporary apartment furniture locally. Most of it ended up at the curb at the end of the year along with lots of similar pieces from others – so we never really tested its longevity. I like to think that some of it got picked up and recycled by other students – but I suspect a lot of it just got carted off with the trash. My wife and I bought IKEA Hemnes solid-wood dressers around 10 years ago, and they’ve held up well. Maybe eventually we’ll get a bedroom set. I anticipate replacing some of our IKEA furniture, likely repurposing them in the basement or elsewhere, but right now life is too chaotic to go furniture shopping, let alone make things like dressers myself. Growing up, I had a nice solid wood dresser. But how long will it take for me to find anything like that for my kids? A very long time. If buying local will result in plywood, particular board, or thin-veneered furniture, why not IKEA? Some of their products are even made in the USA, such as the kitchen cabinets I hung in my office. I’m also not prepared to spend 10X to 15X or more on my kids’ first furniture, which is what it’ll take to buy heirloom-quality pieces. Maybe in a few years, if my woodworking skills don’t grow fast enough. joking aside – while I partially hate IKEA I do have to say this. If you are paying attention you will notice that IKEA stuff has grades – and some of them are rather quite good quality. Specifically it’s not made in china either, though a good bit of their other stuff is. SO not all of it is crap, and some is better quality than you will find in some american furniture stores. While I was waiting for delivery I found that my whatchamacallit set had some PZ bits which got me going a day early. It was good having two sets as I could leave one set in a hand driver and one in a bit holder in the drill so I could drive screws then do fine adjustments. And then there is JIS for automotive use. I now have three types of cross-drivers (Pozidrive, Phillips and JIS). Plus Torx and also Robertson in many more sizes. Sometimes you just wish we could start over. Only one type of sockets, and one type of screw drivers. My toolbox could be 1/3 of the size and I could have afforded tools that were 3x more expensive. Ikea is crap and their customer service is even crappier. They shouldn’t be allowed to manufacture anything. Particle board or formica board should not be used to make anything pertinent to cabinetry or shelving or furniture. Crap. Meanwhile back in reality, pretty much any affordable mass produced furniture is going to use engineered materials in some way. If you can spend many thousands of dollars on real solid hardwood furniture throughout your entire home(that your kids/pets will trash regardless) then good for you. But most people can’t. I don’t know. Some things are pretty good. I have some table lamps that were cheap and look nice. Also, they do sell solid wood furniture. Most are pine, but some things like table tops come in solid birch or oak. The pine stuff is sometimes cheaper than what I’d pay for the raw lumber. My dad made our furniture and worked 50 hours graveyard shift a week while raising 4 boys. Mom worked 9-5. My boys are now using that very same furniture. So It can be done if you really want to do it. I highly doubt ikea would last 2 generations. Ikea wasn’t around back in the 70’s and 80’s and cheap crappy furniture wasn’t available like it is today. If it was, it wouldn’t have been an option anyway. We would have destroyed it within a year or two. Ok, I was organizing my bits into a thin stanley organizer, and came across a PR2 bit. It was much smaller than a phillips #2 but looked like it. I think it is a combo of a phillips and robertson bit. Anyone know? Thanks Hilton and fred, mystery solved! And then there is the Pozi/Slotted – combo. A lot of electrical terminal screws are this way. Whia makes a nice screwdriver and there are individual bots too. Called a xeno driver, see my other posts above for more details. Yeah I saw that after I posted it. Never knew it was called a Xeno driver. Those are different beast all together. Those are better suited, still in the electrical trade, but for conduit connectors and couplings. Some electrical panels screws. Even receptacle screws. Having moved not too long ago, we replaced some of our furniture with Ikea flat packs. I found that an impact driver worked best for me. Mind you, you need a fairly light touch, which after doing up the first couple of screws comes sort of naturally. Best way I can describe it is let the impact hit 2-3 times and that is about right. I visited an Ikea store for the first time in my life. I’ve built all of our furniture, minus the couches and armoire, myself. Well, we just moved and needed a quick fix for a towel and sheet organizer. I put together a particle board white veneer book case with drawers and found myself laughing at the plastic screw locks and plastic compression wedges that hold the drawers in place. I USED GLUE IN EVERY SPOT I COULD! If it took an 18650 and had a brushless motor in the handle, I would love it. I have used pozidrive screwdrivers since I worked for HP in the 70’s. I love them and have found that they work better on some phillips screws than a phillips driver. With their deeper pitch they seem to fit deeper into the phillps screws. I wouldn’t give mine up for anything even though they are over 40 years old. I’ve been assembling a ton of IKEA and other flat-pack furniture, and never realized those were pozidrive and not Phillips! When it comes to hex screws, i always throw away the allen wrenches they include. I swear by my Stanley Fatmax ratcheting screwdriver with a set of metric hex bits. Kobalt double-drive works well too and includes all the bits but I prefer one handed operation. which one is best for the ikea ? Sorry, I don’t know about either of those 2 drivers. It looks like 009315 could be the same as the one I linked to.